Activist merch has been around for decades but in the Trump era, cause t-shirts and sweatshirts increasingly (and visibly) echo an angry U.S. population. Consider the day after Trump took office in January 2017 where the Women’s March in Washington, DC, became one of the largest demonstrations in US history. With the global protests came the cheap t-shirts spotlighting every heroine who’d ever made strides for women and more feminist memes than needed fabric. 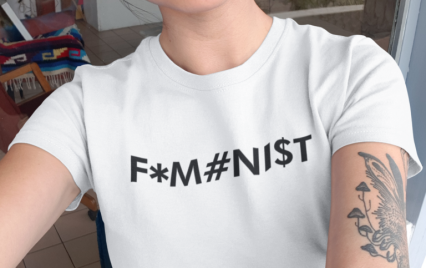 While there’s nothing wrong with toting resistance, persistence and feminism, there’s a huge problem when your feminist t-shirt is made by women slaves. This International Women’s Day, I urge you to think of the many ways women are being hushed and underpaid in male-dominated board rooms, and globally abused in fast fashion sweatshops. And before you put on your next “Feminist AF” t-shirt, I want you to ask where that t-shirt might have come from and who made it. It probably was a woman and my bet is that she wasn’t paid a wage that made her feel like waving her feminist-empowered freak flag. Thanks to the internet, asking brands who made your clothes has become a lot easier. You can find contact names and emails for almost any company in the world and for any PR director or sustainability lead. Not everyone will answer you, but it’s good practice in becoming more conscious and exercising your right to ask.